Once a week, we have Fancy Burger Night. We take a pound of lean ground beef and try to make it the un-leanest thing we’ll eat all week. 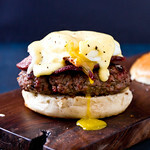 And that right there, that was my husband’s latest contribution, The Eggs Benedict Burger. Crispy bacon, a poached egg, and a spoonful of dreamy hollandaise sauce top a plain burger. Okay, it’s definitely that terrible for you. Crispy bacon, a poached egg, and hollandaise sauce top this dinner-meets-breakfast burger. In a heatproof bowl set over a pan of simmering water, whisk egg yolks with water, whisking vigorously, until mixture thickens, about 5 minutes. Remove from heat, and stir in lemon juice. Whisk in 1-2 pieces of butter at a time until melted. Season with salt and pepper. Keep warm over the doubler boiler, whisking occasionally and adding 1-2 tsp hot water if the sauce thickens too much. Season ground beef with a pinch of salt, black pepper, and a few dashes of Worcestershire. Divide ground beef into 3 equal portions and form into a patty. Cook on the grill 4-5 minutes each side, until cooked to desired doneness. Assemble on buns and top with crispy bacon, an egg, and a spoonful of hollandaise sauce. This looks amazing! Eggs Benedict is my favorite brunch, and the idea of it on top of a burger sounds insanely good. I’ve had your avocado eggs benedict on my “to make” list for awhile, and I bet that would be great on a burger too! You just blew my freaking mind. It might be THAT terrible..but it sounds pretty darn worth it. If you’re going down, at least you’re going down happy! I swear, my husband is not happy at a burger place if he can not find a burger with an egg on it. I think he would love this. Hi, great recipe! I think my hubby would just love this. Never tried home made hollandaise though – will definitely give it a bash! Now that is a nice burger! I was just discussing hollandaise with friends! I’m going to have to try it, now. I love eggs on burgers, and I’m sure I will love it more with the sauce. That is just about one of the most unholy burgers I have ever seen. It looks so delicious!!! uhm, woah. In a good way. Good grief, this is OFF THE HOOK. I love the deep blue background for this photo, by the by. It’s absolutely perfect for it. This looks ridiculous! Can’t wait to try it!! Wow, such a great idea to combine two great foods into one! Thanks for sharing it, I am putting it on my list of must-try recipes. Whoa….that’s pretty intense….not sure I could handle it, but I’m sure it’s a big hit!